Greenleaf Book Group, 9781626340077, 28pp. When Jimmy is diagnosed with epilepsy, he starts to worry. What is happening to my body? Am I ok? Does this mean I m different from other kids? This superhero saga provides an entertaining and indispensable tool for parents and medical professionals who are seeking a positive way to help young epilepsy patients understand their condition and deal with their fears. As a well-respected physician who specializes in the treatment of women and children, the author presents challenging medical concepts in clear, accurate, and understandable prose. 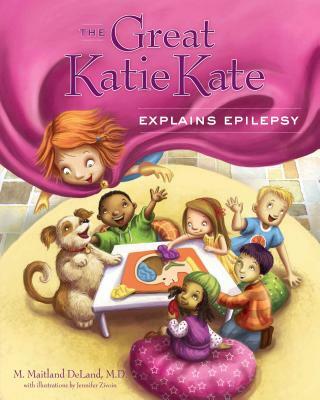 This is the fourth book in the Great Katie Kate series, helping young children with serious illnesses understand their condition and live with confidence. M. Maitland DeLand, M.D., is a radiation oncologist specializing in the treatment of women s and children s cancer. One of the leaders in her field, she is the chairman of the Health Education Authority of Louisiana Board that serves to promote medical education, research, and healthcare throughout the state. Dr. DeLand also serves as a member of the Breastcancer.org Professional Advisory Board. She has dedicated her career to helping her patients and their families lead balanced and rewarding lives. Jennifer Zivoin is a children s book illustrator living in Carmel, Indiana. Although she has been trained in media ranging from figure drawing to virtual reality, her passion is bringing stories to life through her watercolor paintings. Her most recent work has been creating illustrations for Brian James s popular Pirate School series."